Did you receive a WhatsApp subscription ending email or text? Watch out! It is a scam to steal your payment and personal data. Researcher Graham Cluley is warning of bogus ‘WhatsApp subscription ending’ emails and texts. 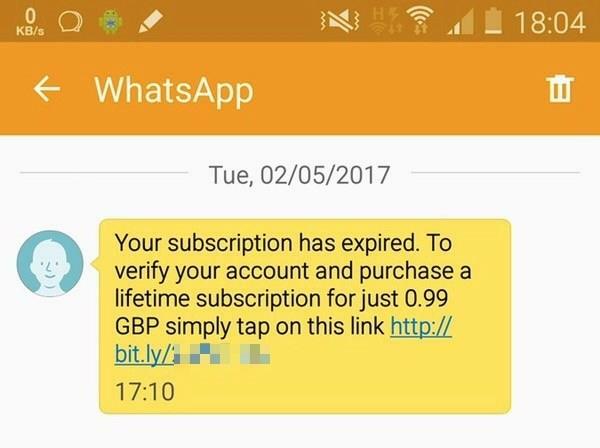 Internet users are receiving an email pretending to be from WhatsApp and warning them of the ending for an alleged WhatsApp subscription. 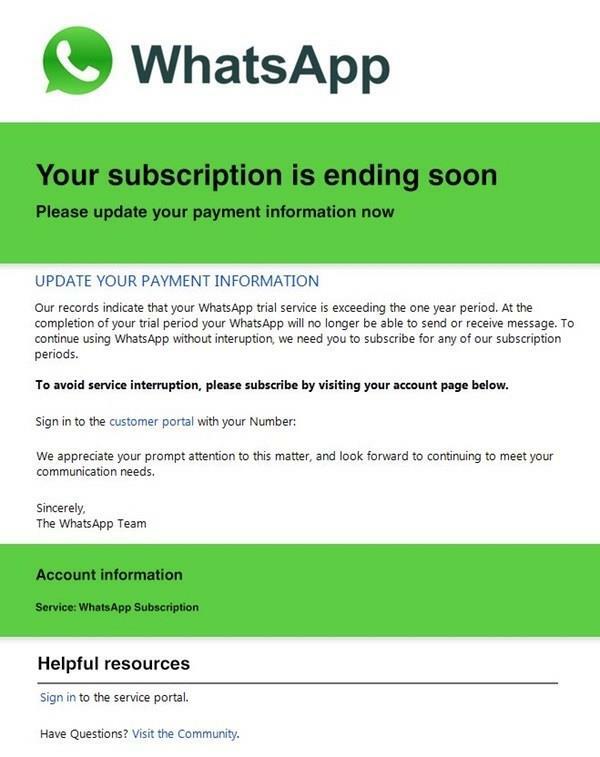 Although the company stopped requesting any payment since January 2016, crooks are attempting to exploit the fact that in the past, WhatsApp used to ask users to pay a fee after they had been using the service for a year. Using this social engineering attack, crooks aim to trick users into clicking links including in the messages that might result in they handing their payment information over to attackers. “Beware! The emails are, of course, a scam designed to trick you into clicking links that might result in you handing your payment information over to fraudsters.” states the blog post published by Graham Cluley on the ESET blog. Our records indicate that your WhatsApp trial service is exceeding the one year period. At the completion of your trial period your WhatsApp will no longer be able to send or receive message. To continue using WhatsApp without interruption, we need you to subscribe for any of our subscription periods. As usual, you should always be wary of unsolicited email messages and SMS text messages claiming to come from WhatsApp demanding payments or the verification of your account’s credentials. “You ultimately decide what links you click on, and whether you hand over your passwords and payment card details. Always think twice, because the wrong decision could prove costly.” concluded Graham Cluley.